Dhivya Matric Hr Sec School, Thiruvannamalai has advertised in THE HINDU for the recruitment of Teachers plus Principal jobs vacancies. Interested and eligible job aspirants are requested to apply with in 25th April 2018. Check out further more details below. 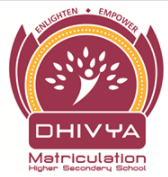 About School: Dhivya Matriculation Higher Secondary School is recognized by Government of Tamil Nadu and affiliated to Directorate of Matriculation Schools, Chennai.The management has an excellent track record for more than 20 years for serving education in very high standards.